Recently, some members of our team paid a visit to Haiti to meet participants from our program. The trip was meaningful and brought to life many aspects of Plant With Purpose’s program. Our Creative Director, Philippe, shares about an encounter meeting our friend Gernita. The community of Fonds Verrettes is one that has experienced so much transformation. After driving through Haiti and seeing the harsh environmental conditions that most of the country faced, it was a delightful relief to see a place where reforestation had begun to take root. The growth hasn’t just helped the landscape or the soil of Fonds Verrettes, but its people as well. As Haitians began to overcome environmental issues, they also overcame poverty and started to discover new opportunities. One of them, Gernita, welcomed our team into her home. It was a small structure, made of concrete and tin, with just a couple rooms. She also ran a small convenience store from her front porch. 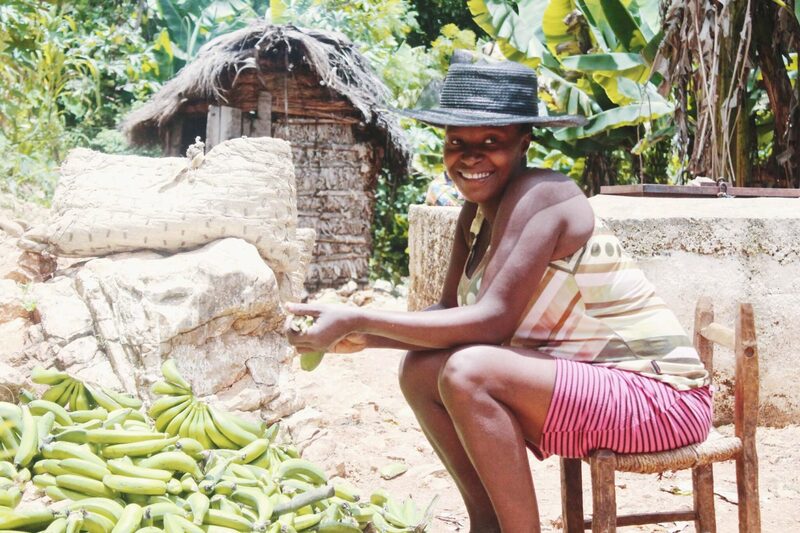 A young woman sorts a banana harvest. Gernita spoke of how she joined Plant With Purpose’s training program, along with many of her neighbors. “The environment changed a lot, because they trained us how to use compost, ramps, building barriers, and grafts. If I had land where water used to wash it away, now I can protect the soil so it doesn’t wash away. I can plant seeds easily,” she smiled. “I used to have no purpose,” she said plainly at one point. Now Gernita grows cabbages, carrots, potatoes, and many other vegetables. She also makes compost soil to give away to her community, increasing the soil fertility overall. She started a small seed business and used that income to pay off her debts. She then proceeded to give a tour of her home, taking our team inside. She showed me the room where she slept, where her grandkids slept. She showed me the small kitchen where she prepared food over an open stove. “You have a beautiful house,” I told her. Gernita’s place also serves as a gathering spot for neighbors. It took me a while to realize what just happened when I said that. It was still a small house, made out of simple stone and concrete. It’s not the kind of house that a lot of people would immediately think of when they think of a beautiful house. But telling Gernita that her home was beautiful didn’t even take a second thought. It came out naturally. And it wasn’t until later that night when I thought about how remarkable it was that I was able to tell her that, truly believing that. I live in an area with a high cost of living and every day I pass by million dollar homes that don’t catch me by surprise. These homes have every single creature comfort and get great weather year-round. Yet, I’ve never once stopped to think, what a beautiful house. The moment I thought that was when Gernita showed me around. The destination is beautiful when the journey is meaningful. I imagined what it was like for Gernita, during those times when she would have to work hard for no payoff. Those times where it felt like she was living with no purpose. Gernita’s house was more than just a place to live. It was a reminder that as distant as progress in Haiti can feel, change is still possible. Change still happens. Her house is a testament to God’s faithfulness and her hope. And therein lies the beauty. Plant With Purpose works with people like Gernita in Haiti, addressing environmental, economic, and spiritual needs holistically. We believe that the only way to create lasting change in these areas is to address them by their roots. We seek to extend this impact to hundreds of other communities. To join us, consider becoming a Purpose Partner.